The artist's estate until 2015. To view portraits and sculptures currently for sale at Philip Mould & Co, please go to www.philipmould.com. 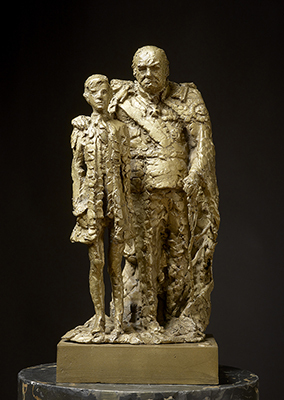 This touching work by the Dutch sculptor Willem Verbon depicts Winston Churchill, the most significant British politician and wartime leader of the 20th century, with his arm tenderly placed around his grandson’s shoulder at the Queen’s coronation ceremony in June 1953. The expressive nature of this sculpture is partly achieved by the process of conspicuously casting hand-modelled clay, and shows a stylistic debt to the sculptor’s friend Jacob Epstein. The technique also poetically accents the familial connection between grandfather and grandson, both taking physical shape from the same elemental material. Surprisingly, considering his inestimable fame throughout his professional career, there are very few sculptures taken from life of Churchill but Verbon, with assistance from those close to his sitter, was given special access to the chamber of the House of Commons in order to observe and sketch Churchill first hand. Through these life sittings, Verbon was able to produce a terracotta maquette for a bronze portrait bust, created at the behest of Rotterdam and situated in the city to this day. Following a viewing of the bust at Downing Street, Churchill wrote to Verbon and said, ‘It is magnificent, but you credited me with more character than I think I’ve got’. Churchill is seen in this sculpture swathed in robes and regalia, with the uniform of the Admiral of the Cinque Ports just visible beneath the robes of a Knight of the Most Ancient Order of Garter, with the 'Great George' chain (lent to him by the Victoria & Albert Museum) draped around his neck; his grandson is clothed in similar ceremonial dress. Churchill, his son Randolph and his grandson Winston were captured in a photograph in their ceremonial dress by the American photographer Toni Frissell, at the Coronation of Queen Elizabeth II; this photograph provides evidence for both the identity of Churchill’s grandson in Verbon’s sculpture and provides an accurate date for this work. Verbon was born in Rotterdam and attended the trade school and later the local Academy of Arts in pursuit of a career in the arts. Although his first exhibition was exclusively for paintings and drawings (1939), he had already been seduced by the tactile nature of clay, believing the three-dimensionality of sculpture to be a more honest medium. He listed the Dutch royal family among his many prestigious patrons, and after winning a postgraduate scholarship from the British Council moved to London in 1947, setting up a workshop in Sloane Street and Jewry Street. Here, he befriended the sculptors Henry Moore and Jacob Epstein, and found inspiration in the city’s vibrant artistic milieu. He described his years in Bloomsbury as pivotal to his development as an artist, and London’s fashionable elite welcomed him with open arms. He soon listed the Duke of Northumberland and Duchess of Kent amongst many eminent patrons. Contemporary accounts suggest that Verbon preferred to curate the entire process of commissioning, from the sitting to the ceremonious unveiling. During his time in England, he stayed in Northamptonshire with the Duchess of Buccleuch, Mary Montagu Douglas Scott, enjoying her attentive hospitality. Churchill was known to be an admirer of her and once famously said that when Mollie Buccleuch entered a room it was ‘as though a light had been turned on’. It therefore seems highly likely that this connection may well have influenced Churchill’s consent to allow Verbon access to make his preparatory sketches in parliament.